After the extravagance of the festive season (now a distant memory! ), it’s always nice to redress the balance and give something back. Being a small charity, we simply couldn’t be without the support of our many volunteers who donate their time and energy to help us with our life-changing work and continue challenging disability through outdoor adventure. 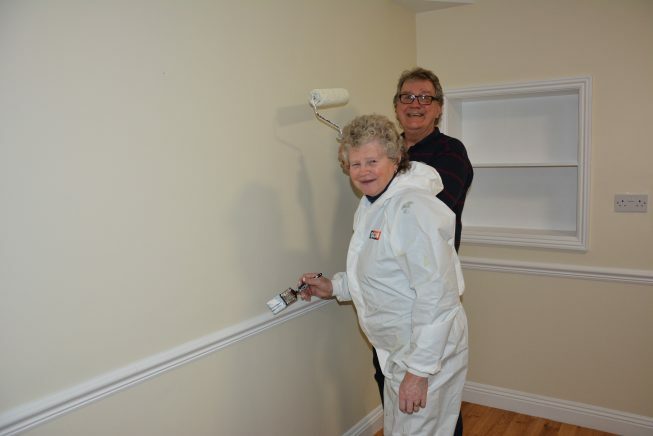 Over the past two weeks, several people from local organisations and the community have come together armed with paintbrushes and rollers, to help give our accommodation a shiny new coat of paint and keep our accessible five-star centre looking its very best ready for our first guests of 2019. We would like to extend a huge THANK YOU to all of the people who gave up their time to paint, in exchange for nothing more than lunch (and an immense amount of appreciation from the staff and trustees of Calvert Trust Exmoor). We loved having you, and hope to see you again at our next ‘Painting Party’! Calvert Trust Exmoor relies on the help and support of volunteers, across the centre, all year round. There are many opportunities for people to get involved – from assisting at a Fundraising event to becoming a weekly volunteer in the Stables. Volunteering can be fun, rewarding and even help you gain new skills. For more information on current volunteering opportunities please visit our Volunteer page.